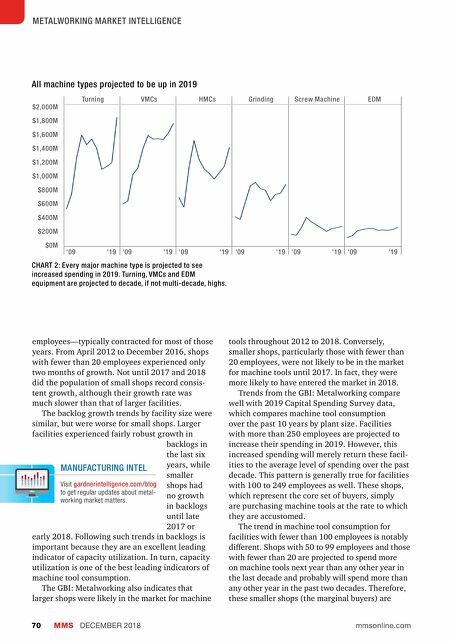 MMS DECEMBER 2018 70 mmsonline.com METALWORKING MARKET INTELLIGENCE employees—typically contracted for most of those years. From April 2012 to December 2016, shops with fewer than 20 employees experienced only two months of growth. Not until 2017 and 2018 did the population of small shops record consis- tent growth, although their growth rate was much slower than that of larger facilities. The backlog growth trends by facility size were similar, but were worse for small shops. Larger facilities experienced fairly robust growth in backlogs in the last six years, while smaller shops had no growth in backlogs until late 2017 or early 2018. Following such trends in backlogs is important because they are an excellent leading indicator of capacity utilization. In turn, capacity utilization is one of the best leading indicators of machine tool consumption. The GBI: Metalworking also indicates that larger shops were likely in the market for machine tools throughout 2012 to 2018. Conversely, smaller shops, particularly those with fewer than 20 employees, were not likely to be in the market for machine tools until 2017. In fact, they were more likely to have entered the market in 2018. Trends from the GBI: Metalworking compare well with 2019 Capital Spending Survey data, which compares machine tool consumption over the past 10 years by plant size. Facilities with more than 250 employees are projected to increase their spending in 2019. However, this increased spending will merely return these facil- ities to the average level of spending over the past decade. This pattern is generally true for facilities with 100 to 249 employees as well. These shops, which represent the core set of buyers, simply are purchasing machine tools at the rate to which they are accustomed. The trend in machine tool consumption for facilities with fewer than 100 employees is notably different. 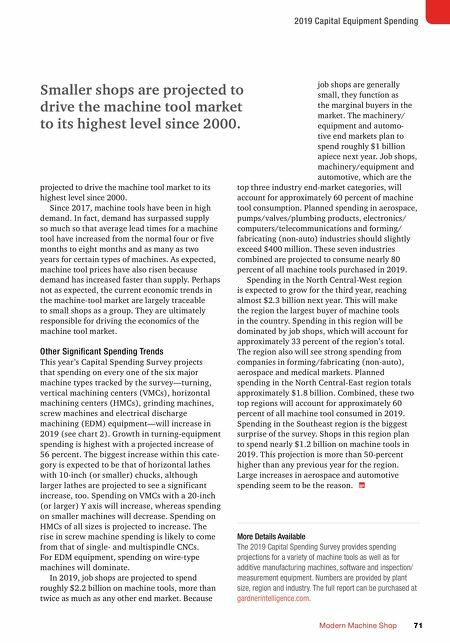 Shops with 50 to 99 employees and those with fewer than 20 are projected to spend more on machine tools next year than any other year in the last decade and probably will spend more than any other year in the past two decades. Therefore, these smaller shops (the marginal buyers) are All machine types projected to be up in 2019 CHART 2: Every major machine type is projected to see increased spending in 2019. Turning, VMCs and EDM equipment are projected to decade, if not multi-decade, highs. '09 Turning VMCs HMCs Grinding Screw Machine EDM $2,000M $1,800M $1,600M $1,400M $1,200M $1,000M $800M $600M $400M $200M $0M '09 '09 '09 '09 '09 '19 '19 '19 '19 '19 '19 MANUFACTURING INTEL Visit gardnerintelligence.com/blog to get regular updates about metal- working market matters.